Go to РІР‚СљReady!EcommerceРІР‚СњР“В РІР‚СљOptionsРІР‚Сњ. Next, select the item РІР‚СљCurrencyРІР‚Сњ. At the bottom select button РІР‚СљAddРІР‚Сњ. 4 РІР‚вЂњ there should be value (for example for USD it is 1.000, forР’В EUR it is 1.230, for GBP it is 1.570). 5 РІР‚вЂњhere you must choose symbolР’В (for example for USD it is $, forР’В EUR it is EUR, for GBP it is Р’Р€). 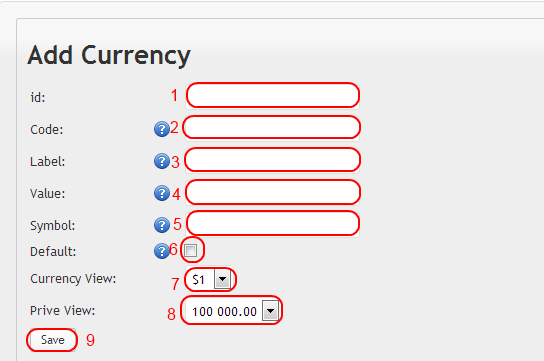 6 РІР‚вЂњ in this item you must to choose whether the default currency.